The goal of our artistic-scientific research project trees: Rendering Ecophysiological Processes Audible, was to connect sounds that occur in trees with ecophysiological processes and thus investigate and render perceptible processes in plants that are not noticeable to humans. The acoustic emissions of a tree in the Swiss Alps were recorded with special acoustic sensors, and all other non-auditory ecophysiological measurement data were sonified–that is, translated into sounds and music. 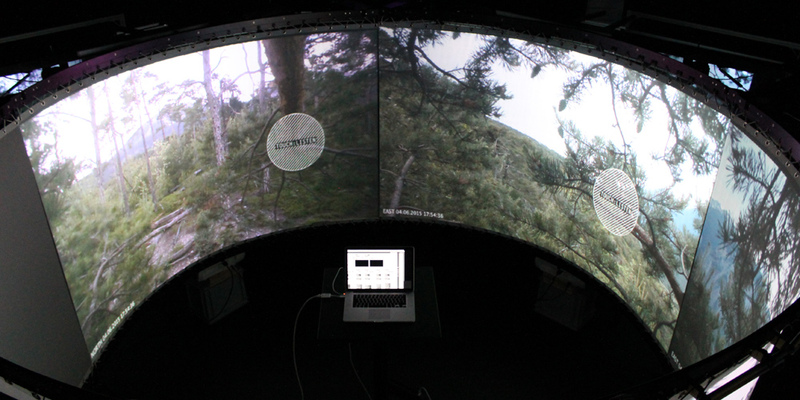 The recordings and sonified measurements were implemented in a number of different media art installations under the preamble “treelab“, which at the same time served as a research environment, in order to display and examine the temporal and spatial connections between plant sounds, physiological processes, and environmental conditions in an artistic­scientific observation system. Most of the sounds that occur in a plant arise due to drought stress. Thirsty plants make an inaudible noise; acoustic emissions from plants lead to conclusions on their state and on the environmental conditions. During our research project it became clear that our observation system could make another fundamental phenomenon tangible: namely, how plants in Central Europe react to ever-longer periods of heat and drought in the course of climate change. The reconstruction and staging of the life processes and environmental conditions of a tree in an artistic-technical environment has led to new forms of observation and artistic design with an innovative instrument: correlations of measured values and patterns in natural processes become aesthetic effects–abstract measurement data are reflected in images and sounds. The intention of our observation system is to create an all-encompassing experience from complex data sets, and thus to draw a holistic picture of the life processes and environmental conditions of a tree that is under pressure from changing climatic conditions. Sonification and artistic realization: Marcus Maeder, Institute for Computer Music and Sound Technology, Zurich University of the Arts (ZHdK). ICST members of staff involved: Philippe Kocher, Jonas Meyer, Thomas Peter. Conception lmmersive Lab: Jan Schacher, Daniel Bisig, Martin Neukom, Philippe Kocher (ICST). Supported by Swiss National Science Foundation SNF, Zurich University of the Arts (ZHdK), Swiss Federal Institute for Forest, Snow and Landscape Research WSL. Marcus Maeder (CH) is a sound artist, researcher and composer of electronic music. Maeder studied Fine Arts in Lucerne, Switzerland and Philosophy in Hagen, Germany and is currently pursuing his PhD in Environmental Systems Sciences at ETH Zurich. As a researcher at the Institute for Computer Music and Sound Technology (ICST) of the Zurich University of the Arts, Maeder is working on Data Sonification, Acoustic Ecology and Bioacoustics and artistic investigations of ecological processes and phenomena that are related to climate change and environmental issues. Roman Zweifel (CH) studied Biology at the University of Zurich and the ETH Zurich, where he gained a doctor’s degree for his ecophysiological work The Rhythm of Trees. He works as a senior researcher at the Swiss Federal Institute for Forest, Snow and Landscape Research WSL and runs the private company natkon.ch, selling measurement equipment and expertise for ecological research. Roman Zweifel has strong expertise in tree physiology and electronics and his career is characterised by interdisciplinary and free-spirited projects. The jury was impressed with the unusual pairing of a forest expert and a researcher in computer music and sound technology that is bringing the so far unheard ‘sounds of trees’ to the surface. By needling tiny microphones beneath the bark of trees, much is revealed about their physiological processes, and about the forest ecosystem in general. Their collaboration resulted in a joint research project on complex environmental data collection and sonification. The sound models serve as a tool to analyze patterns, understand links, and unlock new research areas for both artists and scientists alike. But through a beautiful installation it also helps the general public to experience and gain deeper insight.